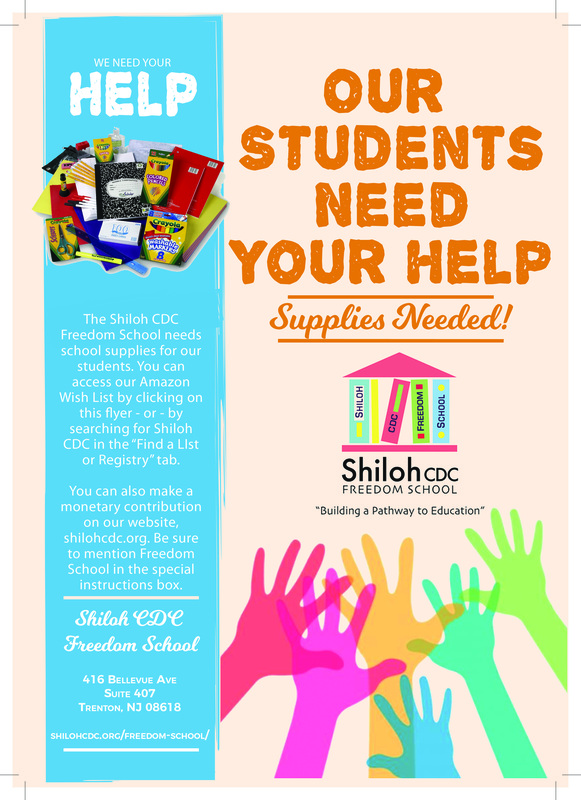 SHILOH CDC FREEDOM SCHOOL NEEDS YOU HELP! Contribute to our program by donation through our Amazon Wish List. This list was created to supply 80 deserving children from Trenton, NJ with the materials they need to have a successful summer at the Shiloh CDC Freedom School. Our program is presented through the Shiloh Community Development Corporation, a non-profit in Trenton, NJ, and the Children's Defense Fund. We serve summer programming to our participating families for their elementary and middle school aged children and focus on reading skills, conflict resolution skills, and social action. Our goal is to give our students the summer experiences they might not otherwise have due to inability to afford other programs. Any and every donation is appreciated and will be put to good use! If you will like to help out even more, use Amazon Smile, and search for Shiloh Community Development Corporation as your charity organization. For every purchase you make, The AmazonSmile Foundation will donate 0.5% of the purchase price from your eligible AmazonSmile purchases. Shiloh Community Development Corporation is a 501(c)(3) nonprofit organization under the regulations of the Internal Revenue Service. All contributions to Shiloh Community Development Corporation are tax-deductible to the extent provided by law. Interested in working for Shiloh CDC? New Jobs Posted! Click here for more info. INFORMATION FILED WITH THE ATTORNEY GENERAL CONCERNING THIS CHARITABLE SOLICITATION AND THE PERCENTAGE OF CONTRIBUTIONS RECEIVED BY THE CHARITY DURING THE LAST REPORTING PERIOD THAT WERE DEDICATED TO THE CHARITABLE PURPOSE MAY BE OBTAINED FROM THE ATTORNEY GENERAL OF THE STATE OF NEW JERSEY BY CALLING 973-504-6215 AND IS AVAILABLE ON THE INTERNET AT http://www.njconsumeraffairs.gov/charities/Pages/charities-registration-information.aspx. REGISTRATION WITH THE ATTORNEY GENERAL DOES NOT IMPLY ENDORSEMENT.